Formed in 1985 by brothers Peter Coyne (vocals) & Chris Coyne (bass/vocals) from the ashes of their previous band The Sid Presley Experience. The Godfathers toured extensively & quickly earned a serious reputation for their electrifying brand of primal rock & roll & their incendiary live shows around the world. Forming a recording partnership with famed producer Vic Maile they released 4 critically acclaimed, smash hit independent singles on their own Corporate Image label ('Lonely Man', 'This Damn Nation', 'I Want Everything' & 'Love Is Dead') which alongside a brutal cover of Lennon's 'Cold Turkey' were compiled into their seminal debut album release 'Hit By Hit' in '86 & signed a worldwide deal with Sony/Epic records in '87. The Godfathers unleashed the storming rocker 'Birth School Work Death' as a single in '87 & scored a US Billboard top 40 hit after massive college radio airplay & heavy MTV rotation. Then the classic 'Birth School Work Death' album was released in '88 (includes the 'hit' anthem title track, & singles 'Cause I Said So' & a re-recorded 'Love Is Dead') & was promoted with extensive tours of the UK, Europe & America as they cemented their reputation as one of the best live acts of the period. Celebrity fans included among others David Bowie & Johnny Depp. Their mob inspired image, raw lyrics & guitar-driven, edgy rock & roll sound was in direct contrast to the clean, synthesized Pop that mainly dominated the mainstream charts at that time & foreshadowed the Brit-Pop/Rock resurgence of the early 1990's. 1989's album 'More Songs About Love And Hate' (featuring the American college radio smash single 'She Gives Me Love' and live favourite 'Walking Talking Johnny Cash Blues') was followed by the death of producer Vic Maile & the departure of guitarist Kris Dollimore, who was replaced on guitar by Chris Burrows for 'Unreal World' (which included the American radio hit 'Unreal World' & a searing cover of The Creation's psychedelic classic 'How Does It Feel To Feel') in 1991. The provocatively titled live Godfathers' album 'Dope, Rock & Roll & F*****g In The Streets' was issued in 1992 on Corporate Image & the band toured the globe constantly. With a new line-up The Godfathers released 2 further albums on Intercord Records, a self-titled album in '93 (AKA 'The Orange' album because of it's distinctive cover art) & 'Afterlife' in '95, before the group finally imploded in 2001. 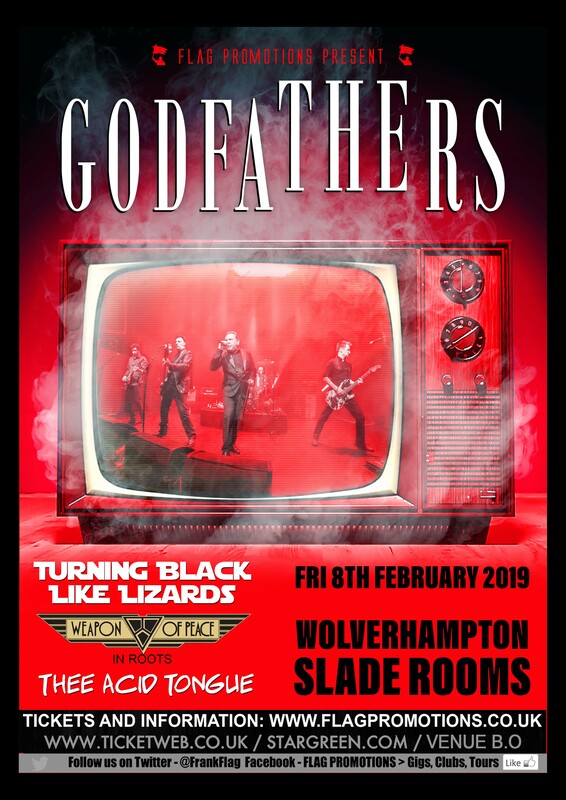 In 2008 The Godfathers reformed their original line-up to promote a vastly expanded 2CD version of their seminal debut album 'Hit By Hit' & performed a select number of British, European & American dates & festivals together for the first time in nearly 20 years. These included the highly successful revival of their traditional Saint Valentine's Day Massacre concerts with knockout, triumphant performances at The Forum in London in February '08 & Chicago's Metro in February '09. The Godfathers have become increasingly influential in recent years with Top 5 American artists Local H & Spoon releasing cover versions of Godfathers' classics "Birth School Work Death' & 'This Damn Nation' & Mars Volta citing The Godfathers' primal rock & roll sound as a direct influence on their 'Noctourniquet' album. 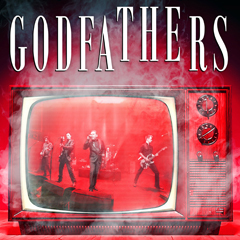 'The Godfathers - Shot Live At The 100 Club' a Live DVD/CD was released November 1st 2010 to mark the 25th anniversary of the bands formation & 'Jukebox Fury' The Godfathers' first new studio album in 18 years was released worldwide in March 2013 to critical acclaim & rave reviews. With the 2017 release of their new album 'A Big Bad Beautiful Noise' The Godfathers have taken a huge, sonic step forward. Look out world - 'A Big Bad Beautiful Noise' is coming!! 'A Big Bad Beautiful Noise' is available from February 10th 2017 on the band's own Godfathers Recordings2 label via Cargo Records in the UK & Europe & Metropolis Records in the USA, Canada & South America.